SCIENTIFIC UPDATE HAS A REPUTATION FOR ITS HIGH QUALITY EVENTS, BOTH FOR THE SCIENTIFIC CONTENT AND ALSO FOR THE EFFICIENCY OF ITS ORGANISATION. KEEP YOUR SKILLS UP TO DATE AND INVEST IN YOUR CONTINUING PERSONAL PROFESSIONAL DEVELOPMENT. Chemical process research and development is recognised as a key function during the commercialisation of a new product particularly in the generic and contract manufacturing arms of the chemical, agrochemical and pharmaceutical industries. The synthesis and individual processes must be economic, safe and must generate product that meets the necessary quality requirements. Mesoporous carbon nitride grafted n-bromobutane shows high catalytic activity in the solvent-free cycloaddition of CO2 with propylene oxide to propylene carbonate, affording a maximum yield of 88% with a TOF up to 10.7 h-1. A new type of mesoporous-C4N4-based catalyst (n-butBr/mp-C3N4) was prepared by simple grafting of n-bromobutane. The N2 adsorption–desorption and X-ray diffraction characterizations indicate that, in comparison with the parent mp-C3N4, the textual and structural properties have been well retained by n-butBr/mp-C3N4. In the cycloaddition of CO2 with propylene epoxide, the n-butBr/mp-C3N4 exhibits high catalytic conversion as well as a high selectivity to propylene carbonate. The maximum TOF value obtained over n-butBr/mp-C3N4 is 10.7 h−1 at 6 h under 140 °C, which compares favorably to other reported C3N4-based catalysts. In addition to n-bromobutane, mp-C3N4 materials grafted with other alkyl halides also provide high catalytic activities. According to the Fourier transform infrared and X-ray photoelectron spectroscopy measurements, it is speculated that the catalytic active sites of n-butBr/mp-C3N4 are uncondensed amines and Br anions which originate from the reaction between n-bromobutane and the N-containing heterocycles of mp-C3N4. Proline has been grafted onto silica supports in a single step by reacting trans-4-hydroxy-L-proline with chloropropyl tethers, without the use of protecting groups for the proline amine and carboxylic acid functional groups. The resulting catalysts have been characterised to show that grafting is through reaction with the 4-hydroxy group. The catalysts have been tested in an asymmetric aldol reaction, and shown to be both more active and more enantioselective than equivalent catalysts prepared using a protection/deprotection route for the proline grafting step. 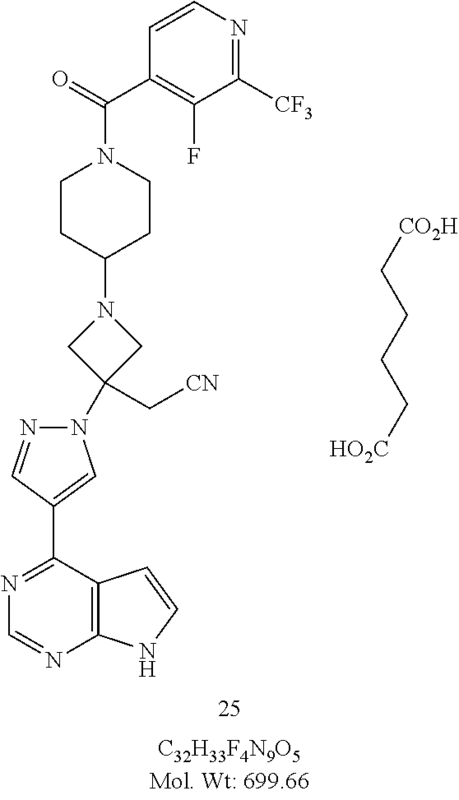 INCB-039110, Janus kinase-1 (JAK-1) inhibitor……..for the treatment of rheumatoid arthritis, myelofibrosis, rheumatoid arthritis and plaque psoriasis. IN PHASE 2 for the treatment of rheumatoid arthritis, myelofibrosis, rheumatoid arthritis and plaque psoriasis. PHILADELPHIA, Aug. 19, 2012 — In a stride toward better health in later life, scientists reported today that resveratrol, the so-called “miracle molecule” found in red wine, might help improve mobility and prevent life-threatening falls among older people. The finding, believed to be the first of its kind, was presented today to some 14,000 scientists and others gathered at the 244thNational Meeting & Exposition of the American Chemical Society, the world’s largest scientific society. The researchers say this report — based on studies of laboratory mice — could lead to the development of natural products designed to help older Americans live safer and more productive lives.